This is studio portrait of Frances Johnson Gayden, who was born April 9, 1873, in Gallitin, Tennessee. Both of her parents were ex-slaves; however, they were skilled and provided a comfortable life for their family. 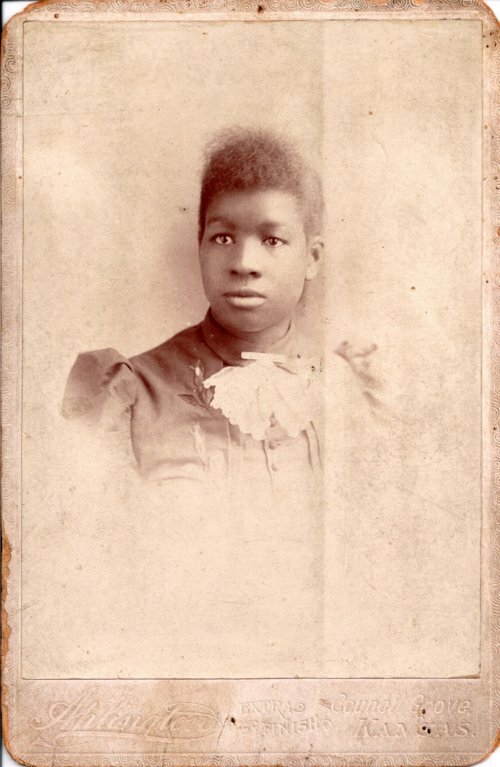 Frances attended elementary school in Dunlap, Kansas, and when she graduated, her mother sent her to a small boarding school for African-American girls in Topeka. After leaving boarding school, she worked for a milliner and later as a domestic. She married Andrew Gayden in 1903, and they lived in Kansas City, Kansas. Later, they moved to Dunlap, Kansas, where they lived until Andrew's death on June 24, 1935. After his death, she and her children could not manage and lost the farm. Frances later moved to Oakland, California, and lived with her daughters. She died in November 1951, while visiting Fern, her daughter. The photograph was taken by the Aplington Studio(?) in Council Grove, Kansas.